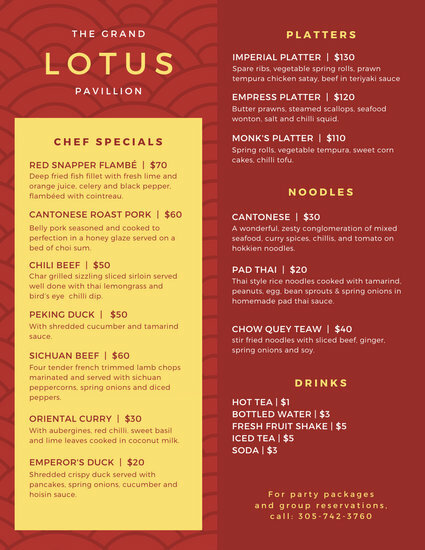 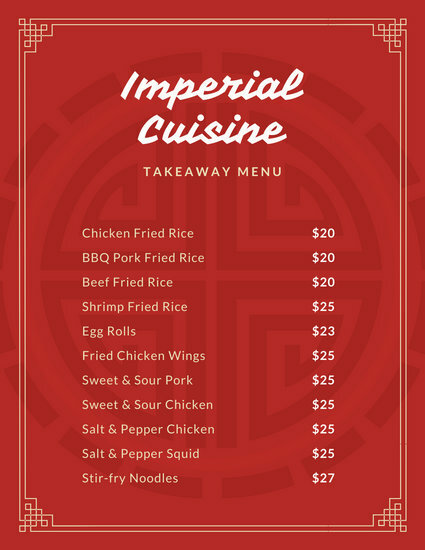 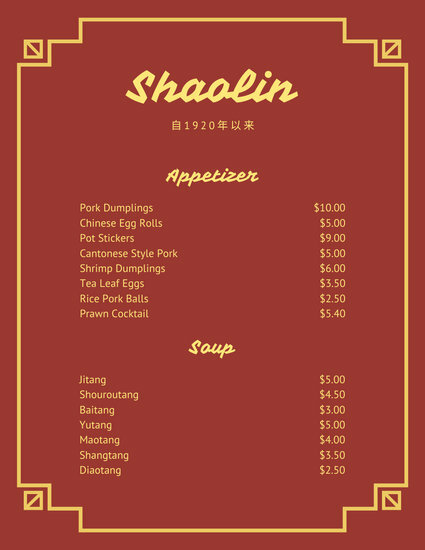 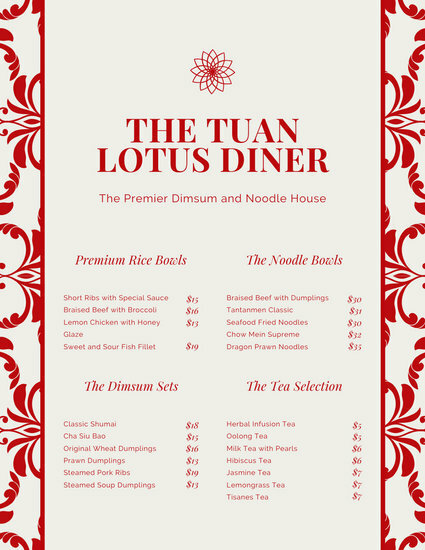 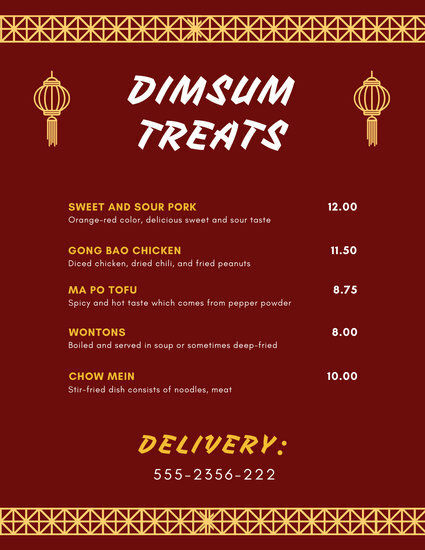 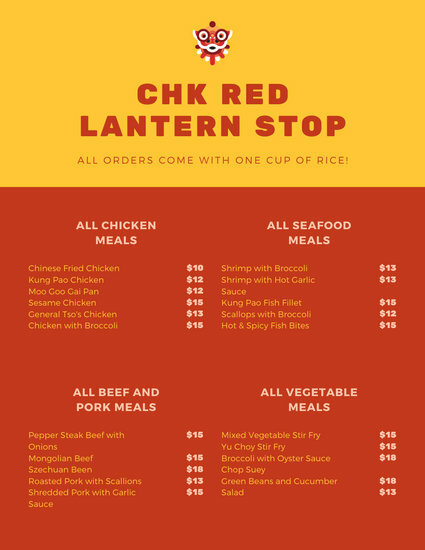 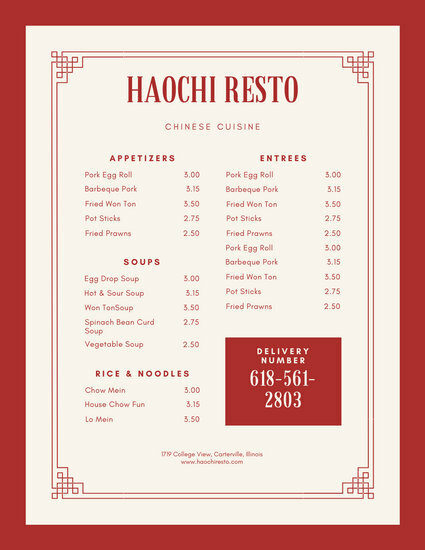 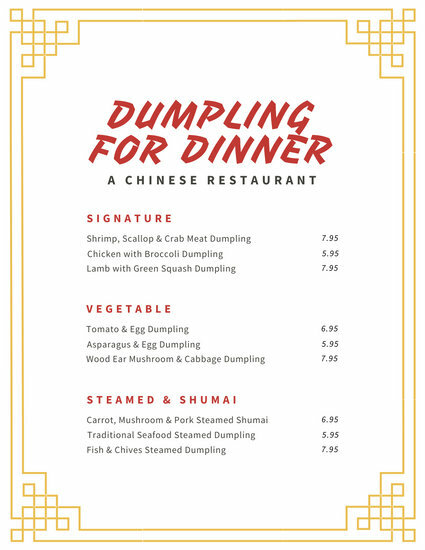 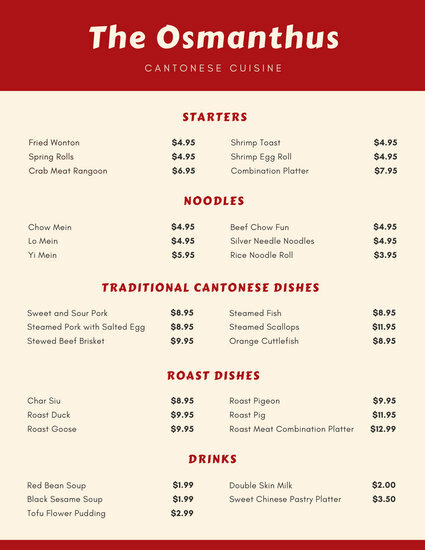 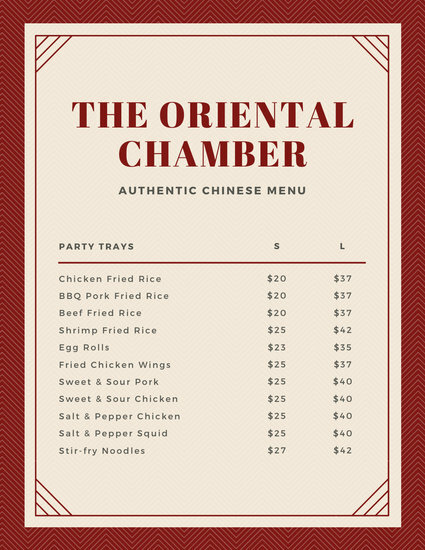 Whether it's for a fancy restaurant or fast food take out, design custom menus from our selection of stylish Chinese menu templates. 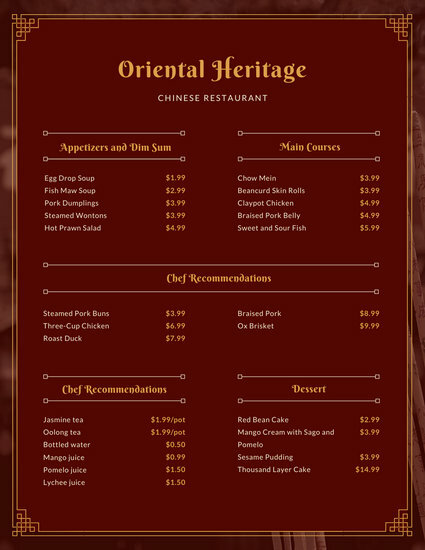 Planning and designing a Chinese menu entails a lot of researching. 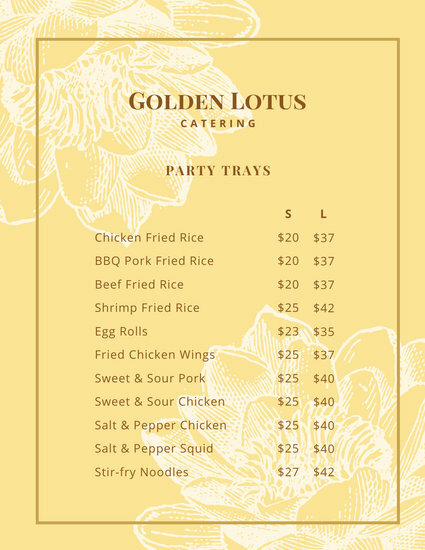 Since a menu can help give your clients an idea about who you are and what your establishment has to offer, you’ll want to make sure you’re getting the right message across. 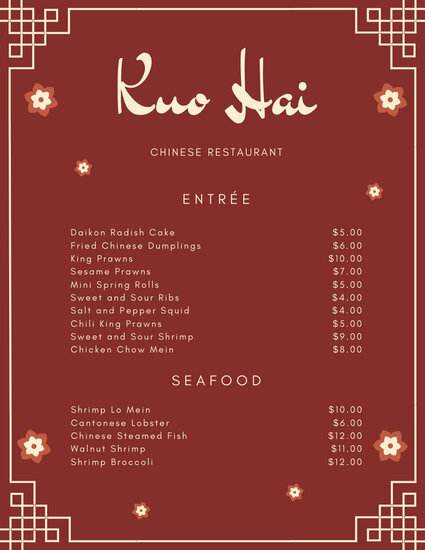 Creating your own menu design also gives you the advantage of easily being able to customize it for special events, occasions, and holidays. 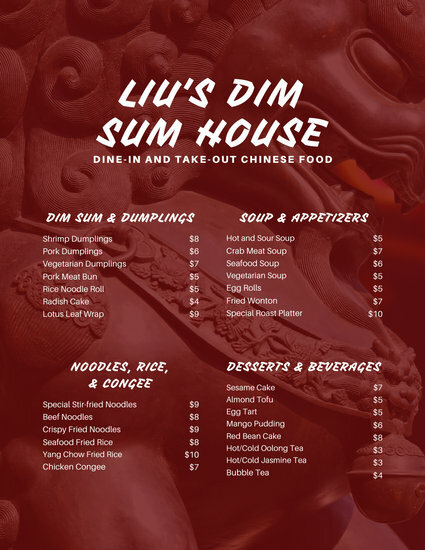 You’ll want to take into consideration the color combinations you plan to use, your logo, and the images you will be using, particularly food photos. 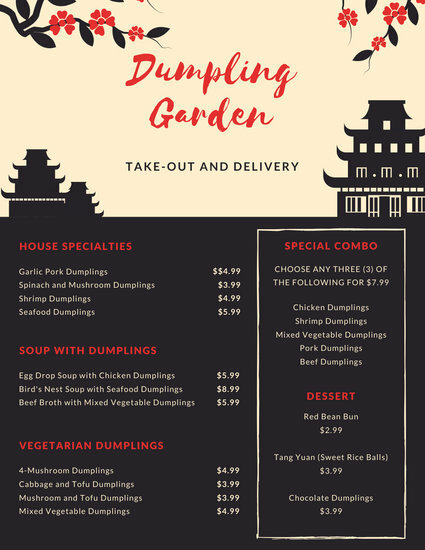 Words also have a great impact. 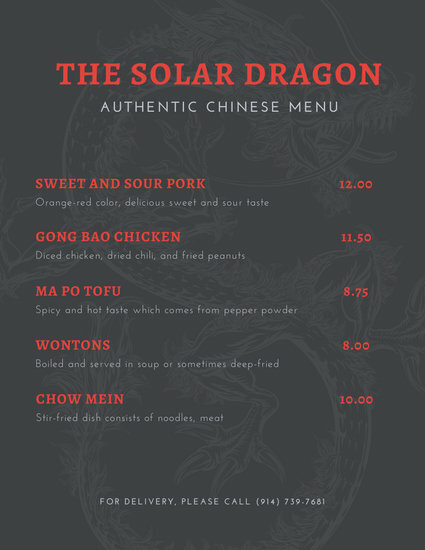 In Chinese cuisine, color, taste, and aroma matter a lot, so you’ll definitely want the images and words in your menu to perfectly represent these. 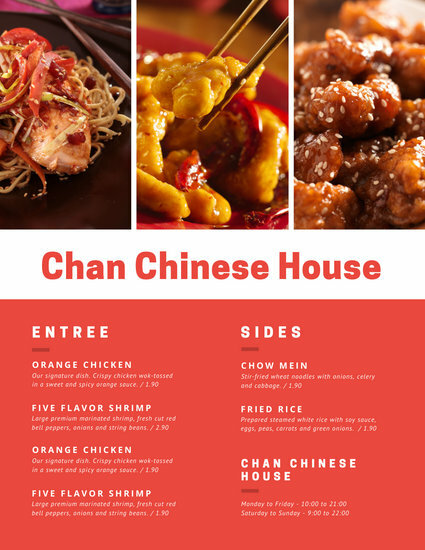 This is where Canva’s templates and user-friendly photo editing tools come in handy. 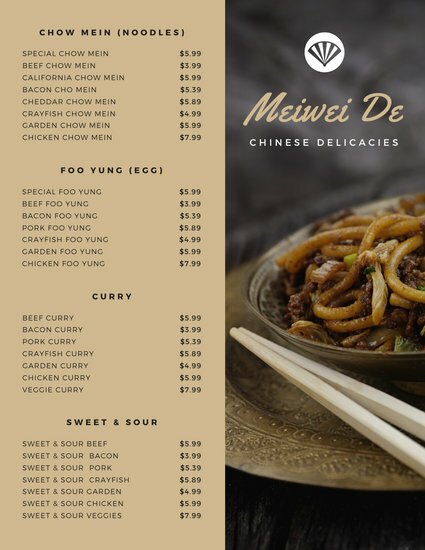 Select a fitting background for your menu by browsing Canva’s collection of stock photos, choosing a plain color, or even incorporating Oriental colors into your menu using the color palette generator. 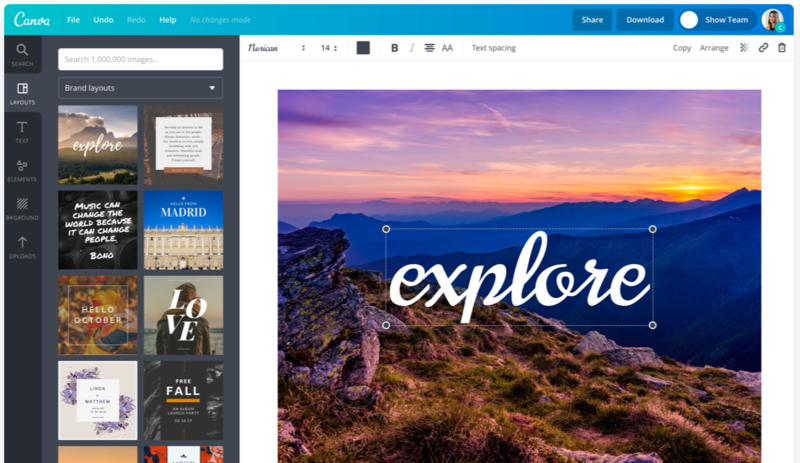 Personalize your design further by adding fitting images from Canva’s extensive media library or uploading one straight from your drive. 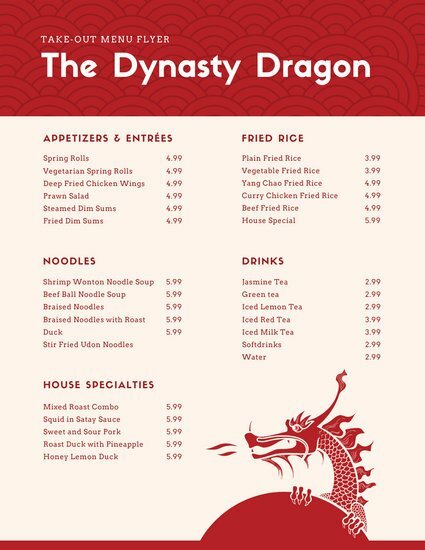 Some popular choices would be dragons, temple dogs, lion heads, and koi. 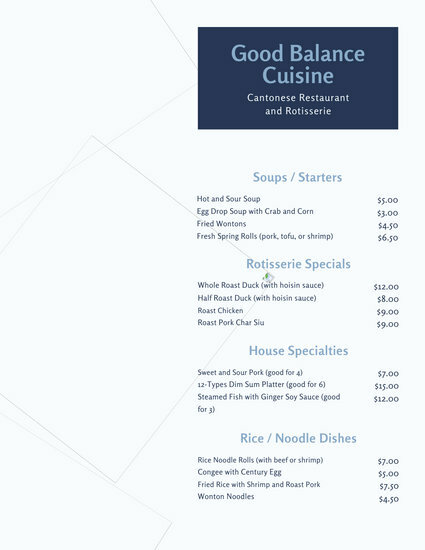 For a menu that’s easy to read, experiment with font combinations, text styles, and sizes using text and formatting tool. 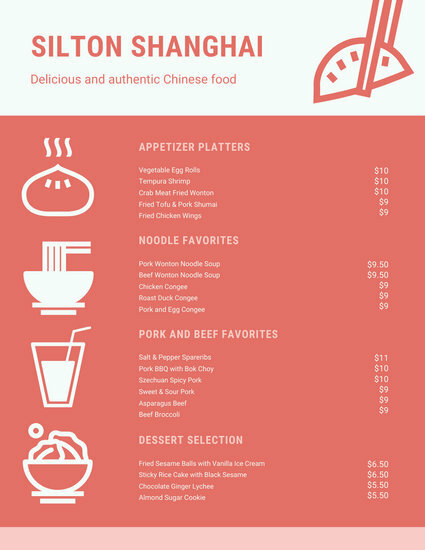 Happy with your final design? 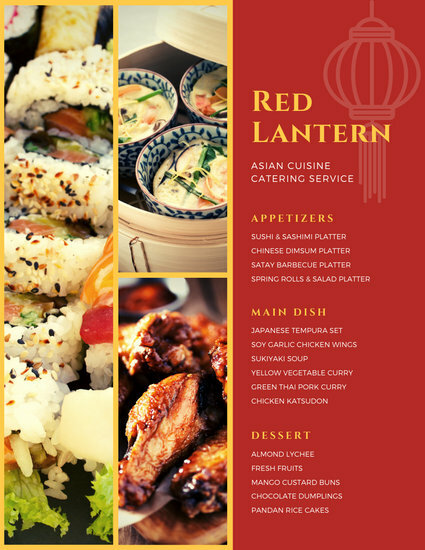 Share it on social media or through email, or simply save and download it to your computer. 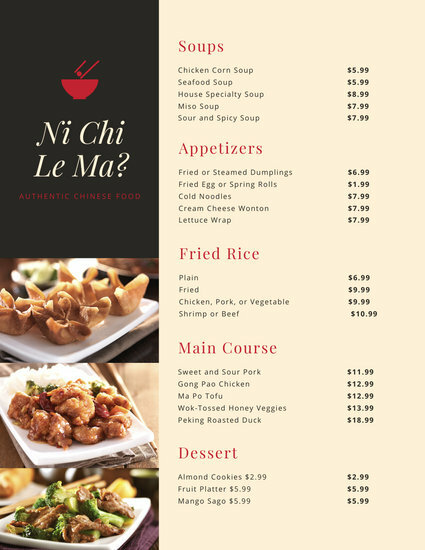 Putting together a Chinese menu has never been this fun and easy!